The Federal Reserve is currently communicating to the markets that it will likely pivot, and pause two strategies. The first pivot is to stop increasing interest rates. The second pivot is to stop unwinding the Fed balance sheet. While the interest rate pause is getting the most attention - the balance sheet pause could be the most important one for investors over the coming years. As explored herein, the impact of pausing the unwinding the balance sheet is to create a new floor at about $4 trillion in Federal Reserve assets. And if the business cycle has not been repealed and there is another recession - the Fed fully intends to go back to quantitative easing, potentially creating more trillions of dollars to be used for market interventions, and to stack another round of balance sheet expansion right on top of the previous round. The graph above shows the radical expansions of the Federal Reserve balance sheet during and after the financial crisis of 2008. The Fed began September of 2008 with about $900 billion in assets, and it can easily be seen that the growth in assets in previous years had been a very steady and slow process. Two months later, by the beginning of November of 2008, the assets owned by the Federal Reserve had more than doubled to about $2.1 trillion, creating a dramatic spike of over $1 trillion in new assets. The Fed needed that first $1+ trillion so that it could loan it to the investment banks and stop a bank run in a process that would've likely essentially wiped out the global financial system in a matter of weeks or months. However, the money to make the new loans simply wasn't there, so the Fed just created the trillion dollars via a process known as quantitative easing or QE. In doing so, the Fed also "pulled back the curtain" and unmistakably proved that money isn't what most people think it is to this day. From that point, the Fed was supposed to rapidly "shut the curtain" again, and make the banks repay the loans once the height of emergency had passed. These loans were the new assets on the Federal Reserve balance sheet, and as they were paid back, the newly created trillion dollars were supposed to rapidly disappear back into the nothingness from which they had come, as the Federal Reserve balance sheet would shrink back to its previous level. That was the initial plan - this incredibly bizarre situation (by previous standards) was supposed to be a one time and very brief anomaly, to be used only in the direst of emergencies. And indeed, if we look closely at the graph, we can see that the promised unwinding process did start and it did so quite rapidly. 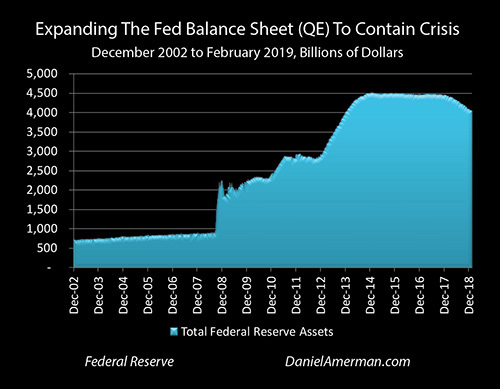 The Federal Reserve balance sheet initially peaked at $2.25 trillion in December of 2008, and swiftly fell by $400 billion in the next two months to $1.84 trillion, meaning that the Fed was on pace to get back to a normal balance sheet - and normal money - by the summer of 2009. However, the United States was in the midst of the Great Recession, and as explored in the analysis linked here, the Fed for the first time in decades lacked the "ammunition" to exit the recession using its primary weapon. Interest rates started too low, and even slamming them all the way down to zero percent, wasn't enough to jolt the economy out of recession. So the mission changed - and the Fed didn't give the money (and the power) back after all. While very people remember it today - because very few people understood what was happening at the time - the Fed reneged on its promise in the second half of February of 2009. Even once the recession formally ended, the "recovery" was still faltering and slow, so the Federal Reserve began a new round of balance sheet expansion instead of reduction, with a goal of stabilizing and stimulating the economy. Neither money nor the investment markets have been the same since that time. As a very quick summary, the Fed used quantitative easing to create still more money and for a while, the Fed essentially funded new originations for the entire mortgage-backed securities market. In doing so the Federal Reserve effectively funded the purchase of every home that was being bought with a conventional mortgage in the United States - at interest rates below what they have otherwise been - in order to save the housing industry and home values. The Fed then moved on to QE2 (quantitative easing two) and effectively funded the U.S. government's growing deficits during a time of stimulus spending with still more newly created money, even while taking an unprecedented degree of control over medium and long-term interest rates. Assets reached a peak of about $4.5 trillion by December of 2014 - six full years after the crisis which had been the initial justification for creating the trillions in new money - and the Fed then stopped the expansion for about three years. It went to a neutral posture where it neither expanded the balance sheet nor shrank it, but it instead merely replaced assets at the rate at which they matured. In November of 2017 - about nine years after the first expansion - the Federal Reserve finally began a very slow process of balance sheet reduction, i.e. "quantitative tightening". There were no asset sales (which might require recognition of some of the fantastic losses currently hidden on the Federal Reserve balance sheet), but the Fed stopped replacing assets as they matured. As can be seen on the far right of the graph, the Federal Reserve balance sheet shrank by about $400 billion over the next 15 months. However, there was a problem - the markets couldn't handle even that very slow retreat from the fantastic and the abnormal. The creation and spending of money by the trillions for governmental purposes without going through taxation - which was supposed to a very temporary anomaly to be used in only the most dire of emergencies - had over the years become the normal, and then a foundation of elevated market valuations, where this extraordinary intervention could not be withdrawn without precipitating a crash in the markets that had become dependent upon it. So at the very same time that the Fed will apparently be pausing its cycle of increasing interest rates because of fears about the economy and the markets, it is now also discussing pausing the unwinding of its grossly inflated balance sheet. 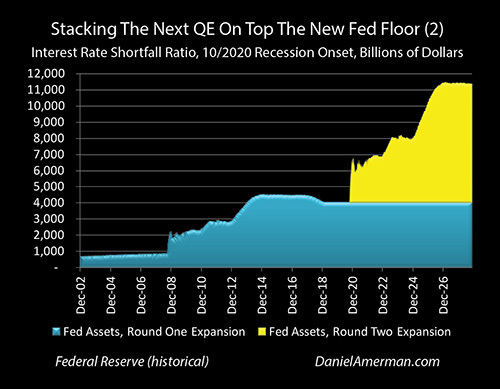 What that means then is that we effectively have not a ceiling on assets of about $4.5 trillion, but a new floor for Federal Reserve assets of about $4 trillion (or perhaps a little less, if the official pause starts later in 2019). Disclosure: This analysis contains the ideas and opinions of the author. It is a conceptual and educational exploration of financial and general economic principles. As with any financial discussion of the future, there cannot be any absolute certainty. While the sources of information and the calculations are believed to be accurate, this is not guaranteed to be true. This educational overview is not intended to be used for trading purposes, those making investment decisions should do their own research and come to their own independent conclusions. This analysis does not constitute specific investment, legal, tax or any other form of professional advice. If specific advice is needed, it should be sought from an appropriate professional. Any liability, responsibility or warranty for the results of the application of the information contained in the analysis, either directly or indirectly, are expressly disclaimed by the author. Daniel R. Amerman is a Chartered Financial Analyst and the author of a number of books on finance and economics. Articles by Mr. Amerman or referencing his work have appeared in numerous publications and websites, including Reuters, MarketWatch, U.S. News & World Report, MSN Money, Seeking Alpha, Business Insider, ValueWatch, Nasdaq.com, Morningstar.com, TalkMarkets and Financial Sense. Two of his books on securities analysis were published by McGraw-Hill (and subsidiary): Mortgage Securities, and Collateralized Mortgage Obligations: Unlock The Secrets Of Mortgage Derivatives. Mr. Amerman is a finance MBA with over 30 years of professional financial experience. As an investment banker he did groundbreaking work in the such areas as CMO/REMIC originations as part of portfolio restructurings for financial institutions, and the creation of synthetic securities for institutional clients. As an independent quantitative analyst, he has provided structural, analytical and mathematical verification services for investment banks, trust departments, and rating agencies. More information is available at DanielAmerman.com.